One of the things I LOVE about being a food blogger is receiving new gluten-free, vegan product to try and review. My Cottage Foods’ timing couldn’t have been better. I’ve had a full plate lately with a big project at work and yoga teacher training. That means no time to bake. I was happy to discover Sweet Magic Bakery and when they asked me to sample some cookies, I had to think long and hard about it…not! These little sweeties came in the mail and I was thrilled to pop them into my mouth. And yes, I did share some with hubby. Vivian started Sweet Magic Bakery and tells My Cottage Foods in an interview,”I saw how many people had allergies and couldn’t find delicious, natural, organic, well-made treats for themselves or their families. So, I decided to specialize in gluten-free, dairy-free and vegan treats.” You can read her entire interview on how she got started here. 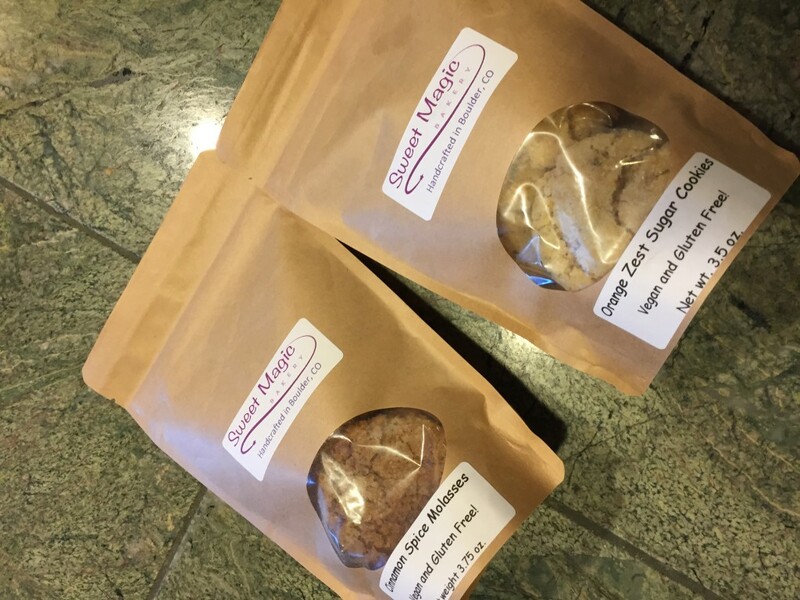 Sweet Magic Bakery sells three varieties of gluten-free vegan cookies. I got to sample two of them: the Orange Zest Sugar Cookies and Cinnamon Spice Molasses Cookies. They also make a Snickerdoodle variety. Both cookies had just the right amount of chewiness and sugary sprinkles on the outside for a little extra sweetness. I was surprised I liked the Orange Zest Sugar Cookie a little more than the Cinnamon Spice Molasses because I LOVE molasses cookies and cinnamon. It could be because of my childhood memories of my grandma’s soft and spicy molasses cookies, but let’s face it – it’s hard to compare anything in a package to grandma’s homemade goodies, right? (I’ve gotta recreate a vegan and gluten-free version of that recipe someday.) Still, I enjoyed the Sweet Magic version and would certainly buy more. The Orange Zest Sugar Cookie was delicious. It was soft and the orange flavor blended nicely with the vanilla. 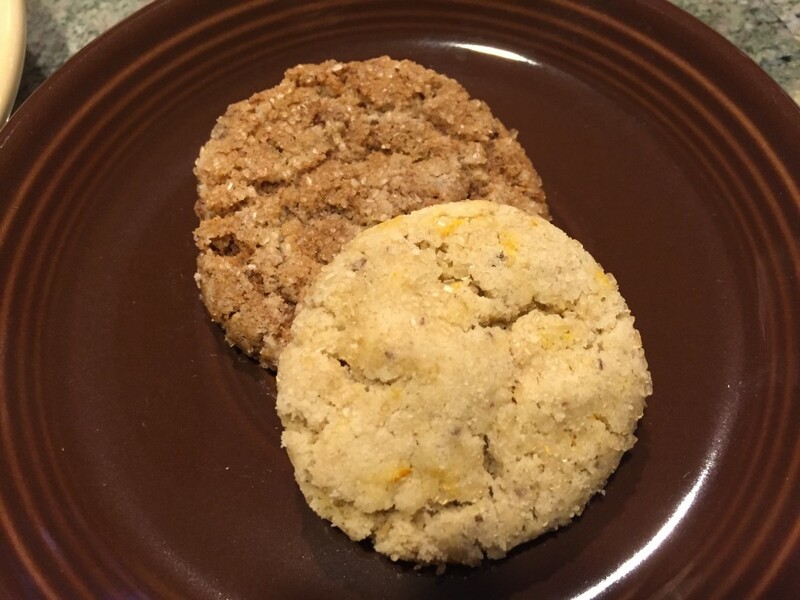 I could see the orange zest in the cookie and taste that it was fresh, not artificial. The Sweet Magic website says these little cookies will “make your taste buds smile” and yes, they did! I want more for sure. Sweet Magic uses non-GMO sugar and lots of organic ingredients, all listed clearly on the website. Products are baked and packed in a dedicated gluten-free kitchen facility in Boulder, Colorado, to eliminate cross-contamination and protect customers from allergens. A bag of 7 runs $5.50 plus shipping. Order cookies from their website below. This entry was posted in desserts, product and book reviews, Vegan Information and tagged gluten fre, gluten-free, glutenfreevegan.me, glutenfreeveganme.com, Sweet Magic Bakery, vegan. Bookmark the permalink.